Over the past 19 months, more than one trillion tons of new ice has formed on Greenland’s surface. This is because a lot more new snow accumulates each year during the long winter, than melts during the short summer. Greenland’s largest glaciers are also expanding. The surface is rapidly gaining ice, and glaciers are growing. So scientists and the press (of course) report the exact opposite. Climate change always leaves you with a paradox it seems. Now the glaciers are sucking up water. Brought to you by the same folks who conned their voters into believing someone like Bernie Sanders could win their nomination. Yet they keep coming back to the New York Times and CNN like lemmings. If you are willing to rig a national election, you wont give tampering with climate record a second thought. Is this mass loss of 200 Gt/yr still a valid figure? It’s in the right order, although the trend over the GRACE-mission since 2002 is more like 250 Gt/yr. But it is only an average number which covers large interannual variability – see the year to year changes at our PolarPortal-page for the GRACE-data. For instance, 2012 saw a very large mass loss while the year after saw close to no loss. I would imagine last year, because there was so much extra accumulation, that the balance would have ended the year as a surplus. GRACE is complete garbage. Those numbers are meaningless gibberish. Grace had KNOWN issues with accuracy, basically it was all over the place. It once found a mountain in Indonesia , that just wasn’t there. They sent a mission called GRASP (iirc) to try to fix it, never heard what happened after that. Any data from before the GRASP mission should be basically ignored as not worth the time. The Arctic, Greenland , and Antarctic regions lie over known volcanic regions. That means moving magma. Magna which has far more volume and is far more dense than ice. and they think gravity measurements are anywhere near accurate.. NOPE. .not in the picture. GRACE does not measure ice. It doesn’t matter what happens; if glaciers start forming and growing in Canada and turn that country into a frozen wasteland, the advocates of climate change (or whatever they’re calling it this week) will claim that those glaciers prove climate change, that they were predicted all along. Climate change is not about weather, the climate, or changes to them but only about political power. It has always been so. Maybe they have better numbers. It is troubling that most writers/researchers/editors have to make a big deal about small advances in their field. Publish or perish. And if you’re a small researcher, you make a big deal about every small discovery. Because you don’t have any large ones. As a geoscientist, I love these images and video. Griff. 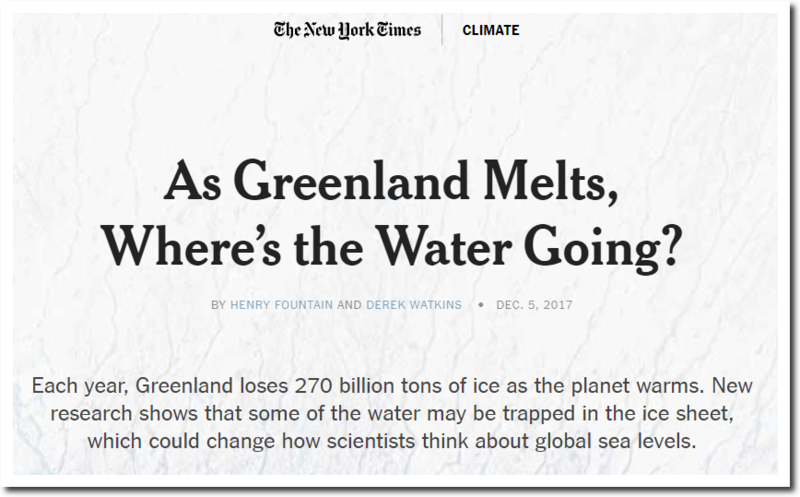 How long does it take to melt the whole Greenland ice with a pace of 500 Gt/year?